I hope you consider growing onions in your garden, not only for diversity, but for better health. If you aren’t growing them, I certainly hope you start eating more of them. As you know, I’m interested in a crop mix that can provide a significant portion of one’s diet, and onions are on the list for sure. From my research, I’ve learned that eating onions helps to improve kidney function, lowers cholesterol, and breaks up mucous in the throat, lungs, and nasal passages. 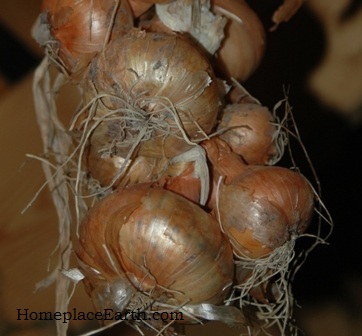 Onions also have antibacterial properties. Eating raw onions regularly could help raise your HDL (good cholesterol) levels. Cooked onions wouldn’t be as effective for that, but cooked or raw, onions have been shown to have blood thinning qualities, acting much the same way that aspirin does. You can read more details about that in Jean Carper’s book, The Food Pharmacy. James Duke, in The Green Pharmacy , recommends onions and garlic for controlling allergies because of their high concentration of quercetin which helps to retard inflammatory reactions. According to Duke, onions, because of their quercetin content, will help reduce cataracts in diabetes patients. Quercetin is important to your health in a lot of ways. Over the years, I remember reading that onions are pretty powerful against cancer, being able to prevent new tumors and slow, or stop, the growth of tumors already present. So, for some updated information I decided to google “onions as a cure for cancer” and found lots of good information, including this article at http://www.brokenearth.org/onioncancer.htm. There is so much out there about the health benefits of eating onions. I had long known that you want to eat the yellow or red storage onions for these benefits and this article affirms that. Then I googled “onions and diabetes” and “onions and heart health”. Check it out for yourself. You want to be eating onions. Although people don’t usually associate onions with calories, onions are one of the more area efficient crops when it comes to growing calories. That means that you can grow more calories in a smaller space with onions than with many other crops. If you were getting a considerable portion of your diet from your garden, you would want to pay attention to this. You can find more information about growing calorie crops in How To Grow More Vegetables by John Jeavons. The new 8th edition is scheduled to be released on February 7, 2012. I found a statistic that said onions are the largest vegetable crop grown in the U.S. If that is so, why don’t I see more onions at the farmers markets? When I was selling at the markets, I found great potential for onions. My customers loved them and I never had enough. If I would have continued selling, rather than turning my energies to teaching, I would have made onions a major crop. Let me tell you, they are a lot easier to manage than most other things. If you do sell them at the markets, educate yourself on these health benefits so you can educate your customers. There are many different kinds of onions, but most important for you to know as a grower is that onions are day-length sensitive. You can’t just stick them in anytime of the year. Generally, the long-day onions are the pungent ones (with more health benefits), and the short-day onions are the sweeter mild ones. 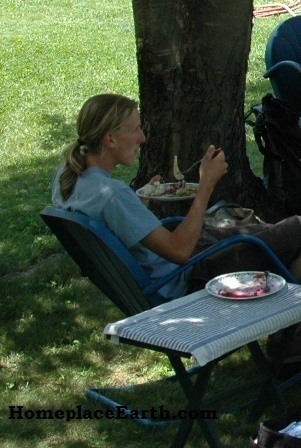 I’m going to let my friend Pam Dawling tell you all about long-day/short-day at http://www.vabf.org/docs/information-sheets . This is a website sponsored by the Virginia Association for Biological Farming, of which I am a member. Look for the information sheet titled Onions: Organic Production in Virginia. Even if you don’t live in Virginia, this article will be helpful to you. Check out the whole VABF website. Their annual conference is in Richmond this year on February 10-11, 2012. I will be there. Look for me in the Homeplace Earth booth. 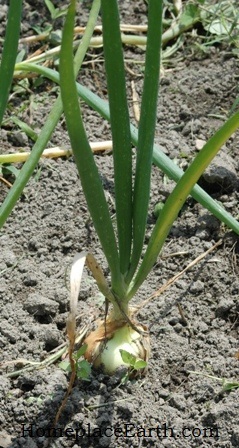 The easiest way to get started with onions is to plant sets, which are small onions. In late winter you will find them at your local feed/garden store. The more local the store is, the better chance that the variety is suited to your area. If you have a choice, look for the ones no bigger around than a dime. The larger ones think they are in their second year of growing and will send up a seed stalk. Large onion sets don’t give you larger onions, they give you onions going to seed. You want to plant them early in March. Preparing the soil in the fall and mulching that space for the winter, or having a cover crop there that will winterkill, would have your space ready for you with little trouble at planting time. If you are starting from seed, now is the time to be doing that. Southern Exposure Seed Exchange is a good source for onion seeds, particularly if you live in the mid-Atlantic. Their catalog has helpful culture information as well as open pollinated varieties, which is what I look for. Here in Virginia, we are right on the line between the recommendations for long-day-vs-short-day varieties. According to the Southern Exposure catalog, “not all LD types can bulb up as far South as Virginia, but ours can”. Choose your varieties carefully. 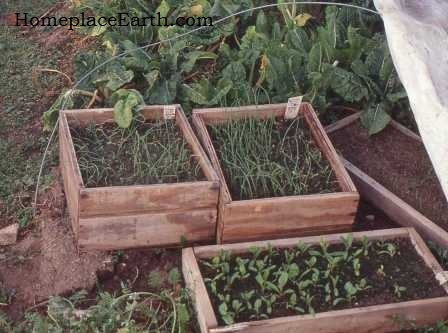 I have gone to starting everything outside in my coldframes and have done that with onions in January. When I was a market gardener I used to have the onion flats in the house for just a week, which is all it took for them to germinate. Then I would put the flats in my small, unheated greenhouse to grow out until planting time, transplanting to deeper flats as necessary. You would be surprised how many roots onions can have and you have to make room for them. This year the bulk of my onions are multiplier ones planted in the fall. They are a whole other thing to learn about—and I’m still learning. I am working with some I got from Southern Exposure and some a neighbor gave me that he’d been growing out for years. (Thanks Ronnie!). I’ll tell you about multipliers another time. While you are waiting for those seeds to come, or for the right time to put the onion sets in, get out your cookbooks and learn more about cooking with onions. They are often a key flavor ingredient. Find ways to get even the reluctant eaters at your table to like them. Your/their health depends on it. WE ALL EAT, SO WE ARE ALL RESPONSIBLE…..
WE ALL EAT, SO WE ARE ALL RESPONSIBLE for how the earth is used to produce our food. We vote with each food purchase, each mouthful. From our perch atop the food chain, it is sometimes hard to see and understand our interconnectedness with the rest of creation. It is also sometimes hard to recognize what we put into our mouths to nourish us as the same thing that is grown on farms and gardens for that purpose. Before we can even begin to think about caring for the land and other parts of creation involved in our food, we have to begin eating food that we can imagine comes from the soil around us. If what you have been eating comes in packages, read the labels. As soon as something is picked, it begins to lose nutrients. Long distance travel and processing continue the decline. Did you know that the U.S. imports food from other countries that may be treated with chemicals banned in this country? If the ingredients are not recognizable as something you could prepare in your own kitchen if you wanted to, you probably don’t want to eat it. If you buy “ready for the microwave” meals, you may want to rethink that. Microwaves destroy nutrients in your food, so you don’t really want to be using them anyway. Crock pots are great. Learn to use one and your dinner is ready whenever you are. Cooking for a small household? Toaster ovens are good for that. Learning to prepare food yourself from homegrown and/or local ingredients can be an adventure that leads you to a healthier lifestyle, community with others, and an appreciation for more things than you ever thought of. 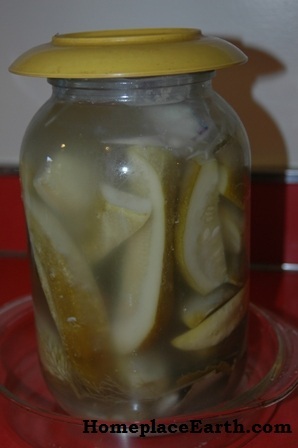 Dill pickles fermenting in a gallon jar. Part of the cycle of life many try to ignore is microorganisms. Without them, we would cease to exist. Microbes are necessary for our food to be transformed into nutrients that our body can use. If things are not working well in your gut, your body becomes unbalanced, causing havoc throughout. A way to replenish those beneficial bacteria in your gut is to eat naturally fermented food. Plain yogurt is a good start. Nourishing Traditions by Sally Fallon gives directions for making naturally fermented sauerkraut, pickles, and other foods by the jar. I know people who have cured their acid reflux problems with sauerkraut. Heating these foods kills the microbes, so the canned versions don’t work for this. Wild Fermentation by Sandor Katz will lead you on more adventures into ferment. Making Sauerkraut by Klaus Kaufmann and Annelies Schoneck will acquaint you further with the nutritional advantages of fermented foods. In my studies of nutrition and of the soil, I’ve come to realize that the same thing going on in our gut with the microbes, is going on in the soil. When the right balance of microorganisms is present, plants thrive. Healthy soil produces healthy plants, which feed healthy people. We are what we eat. We are a people of the earth. When we get our nutrients from REAL food, they come with the enzymes and co-nutrients, in proper proportion, necessary for assimilation in our bodies. Once you learn about all this, you will begin to question your food sources. 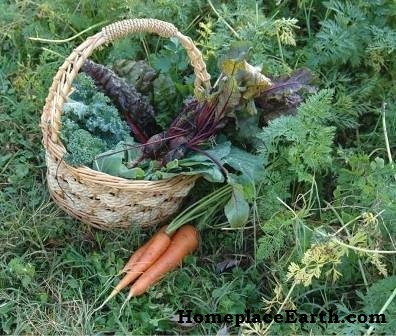 Your quest for food with fewer miles on it, minimally processed and packaged, and grown in a way that builds, rather than depletes, the soil will inevitably lead you to the local growers themselves. A good place to find them is www.localharvest.org. Become a regular at the farmers markets this year. An interesting thing to do is to take a highway map and draw a circle with a 100 mile radius from where you live, and maybe circles for 75, 50, and 25 miles. How much of your food could you find within that circle? You could even start with just one item for a special dinner. I know it is the winter here, although not for all my readers, but there are more winter and online markets opening all the time. Can you imagine if everything on your table at one meal was homegrown and/or local food? If you are new to all this, move slowly and celebrate each new step, keeping a list of your accomplishments. You will have a new appreciation for your nourishment and where it comes from. Gathering together with others to share a meal will become a fulfilling experience. Coming to the table will take on a whole new dimension. Of course, it would be great if you could grow as much of your own food as you can. Everyone will be at a different place along these lines. It is important to start somewhere and for many just cooking a meal with food (no matter where they bought it) that looks like it came from a farm, rather than a processing plant, is a big step. For those of you who are already on this path, check out Ira Wallace’s Gardening in the Southeast blog that she does for Mother Earth News. Ira lives at Acorn Community, home of Southern Exposure Seed Exchange. I’ll be doing Homegrown Fridays during Lent again this year. My friends at Acorn are having Homegrown Fridays (eating only what they’ve grown) on all the Fridays from December until the first Friday of spring. You can read about my 2011 Homegrown Fridays at https://homeplaceearth.wordpress.com/2011/04/19/homegrown-fridays/. I’ll be writing about some important crops that I hope you can include in your garden this year. My next post on January 24 will be about onions. See you then!